Margaret Wild is one of my favorite children’s authors. I love the stories she writes up for children. Below you’ll find some information about Margaret Wild and learn about some of my favorite books by this author including my reviews. My hope is that every child will get the chance to enjoy some of Margaret Wild’s books. Margaret Wild grew up in South America and moved to Australia in 1972. She worked as a journalist and a book editor and now writes books. Since then she’s written over 70 books for children. Margaret has also published two novels titled One Night and Jinx which are both books about the troubles and anxieties that teenagers can become overwhelmed with during their school life, in relationships and growing up. Margaret wrote her first book in 1984 and it’s titled There’s a Sea in my Bedroom. David doesn’t like water and is afraid of the sea, but he loves to collect shells. One day he comes across a special conch shell and learns that he can hear the sea when he puts it up to his ear. At home that evening there’s no limit to David’s imagination. Follow along in the story with David and learn how he overcomes his fear of the sea. I enjoyed looking at the illustrations and seeing how the story unfolds. The story sends a wonderful message to children about how they are capable of conquering their fears. Fox by Margaret Wild is a story about a dog and a bird with disabilities. They become friends and help each other until a jealous fox enters the story to teach them a lesson about what it’s truly like to be alone. This is a story about friendship and betrayal. It’s quite dark and might be better for older children that can cope with the abrupt ending and powerful message. It’s thought provoking and a good discussion book for groups. After the first time reading this I rated it 3 stars because I didn’t really like the abrupt ending, but it sends an important message that doesn’t take children long to figure out. Another aspect that I had a hard time with was the text that’s scattered all around the pages and difficult for kids to read at times. I loved the sketched illustrations by Ron Brooks. This is a book that’s best read to children by a teacher or parent which eliminates the issue with the text and allows discussion after. Harry & Hopper by Margaret Wild is a book about a boy coping with the loss of his dog Hopper. This is a very emotional story that had me tearing up fairly quickly. I haven’t read a book this emotional since Ida, Always. I love the sketched illustrations by Freya Blackwood and the way the story unfolds. Even though it’s a gently told story, it’s extremely sad. Going Home by Margaret Wild is a story about a boy who’s staying at a hospital and starts to communicate with animals as they coax him to embark on journeys with them. “Come, come home with me,” shrieks the elephant. So Hugo puts in his slippers-and goes. The beautiful and vivid illustrations made by Wayne Harris keep the reader engaged. It’s an easy read for younger readers. It’s an all around great story to help children learn to use their imagination to overcome their fears and even boredom. 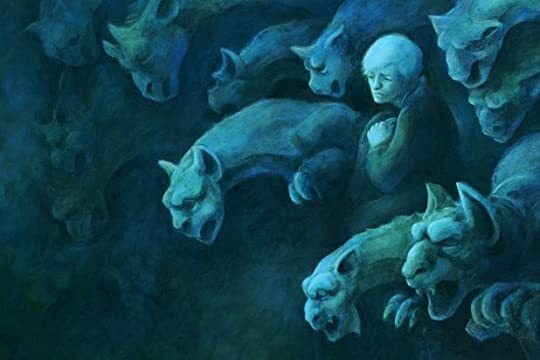 Vampyre by Margaret Wild is a children’s picture book about a boy who just wants to be himself. I love Margaret Wild. She’s undoubtedly one of my favorite children’s authors, so when I saw this scary looking children’s storybook, I had to grab it. The story is told in first person and the boy has basically been born a vampire and isn’t accepting of it. He has to make a choice. This book is very creepy with dark images and can really pack a powerful punch. The boy deals with being rejected because he wants to be something else. The reader is left to contemplate about what you can do when you don’t feel like you belong, and how you can express yourself when what others want for you isn’t your dream. You long for a different direction-a different life. I was really surprised at how dark this story was and it’s probably best for older children grade 7 and up. It’s also a super expensive book and hard to find. The Stone Lion by Margaret Wild is a story about a lifelike stone lion that sits outside the library day in and day out. A little homeless girl named Sara huddles up next to him along with her baby brother for warmth on a cold windy day. The lion doesn’t believe he understands feelings, but knows that somehow he must help Sara and her baby brother. On a horribly cold and wintry night Sara arrives and the lion cries. How can he help her? Follow along in the story to see if the stone lion can help when it seems there’s no hope. Ritva Voutila’s illustrations in the book are captivating and have a tremendous realistic feel to them. I love the story and its influential moral messages of love, bravery and caring for others. Old Pig by Margaret Wild is a very emotional story about Old pig and Granddaughter who’ve lived together for a very long time. They’ve taken care of each other and have enjoyed their days. As Old Pig has gotten older, she’s unable to do as much as she used to and becomes more tired day by day. Granddaughter learns to cherish every moment she has and to pay attention to all the beautiful things we are given here on Earth. The Little Crooked House by Margaret Wild is a story about a crooked man and his crooked cat with a crooked mouse all living in a little crooked house. Living next to a railroad, their house is shaken badly every time the train comes by. The little crooked house takes them on a journey to different areas in hopes of finding the perfect place to settle down. Will they find it? Follow along in the story to learn what happens to the little crooked house and its inhabitants. I loved the story which reminds me of the old nursery rhyme There was a Crooked Man. The illustrations are enjoyable and it has a great ending. Vampyre is a finalist in the 2012 Aurealis Awards in the CHILDREN’S FICTION (told primarily through pictures) category. You can find Margaret Wild on Goodreads and Amazon. I hope you have enjoyed reading about Margaret Wild and please feel free to comment below. If you have any recommendations, please let me know by commenting below or sending a message through the contact page.